We had big plans for the Solstice. We were going to take Ariel to her grandma's house, go shopping and then stay up and watch the lunar eclipse. So after we dropped the kids at grandma's, T-man and I spent the day buying Christmas gifts for the babies. We had a lovely trip to the local Ikea store. We looked at a new desk and chair for me. We looked at the cabinets we want when we redo our kitchen. We checked out new beds. We got some more dish towels. We had a good time making our wish list. Then we went back to the in-laws' and had a lovely family dinner. All-in-all it was a wonderful day. Then it hit me. My stomach started hurting horribly after dinner. I thought maybe those few holiday cookies (yum!) had done me in after all. I started aching on the drive home. When we got home I took an antacid pill. I tried to stay up, but by 10:00 I was in bed. My stomach was still hurting, my muscles were still aching and I was FREEZING! Then I started to shake. It was midnight by this time. Both T-man and Ariel were sound asleep. I woke him and left her sleeping. T-man did take a look outside, but it was so cloudy he couldn't even see the moon. We will skip my part of the story now. At 1:45 Ariel woke up & came into our room wondering why we were missing the eclipse. Poor baby! I really wish things could have worked out differently Monday night/Tuesday morning -- all around! I spent yesterday in bed. Yes, I stayed in bed all day. I feel so much better today, but I'm tired. At least I'm not achy (or anything else!). I figure that, once again, I contracted the flu while Christmas shopping. This is the second time this has happened. Next year I'm going the catalogue/online route. So I wish you Happy Holidays. I hope you and yours are healthy and happy. I hope this past year has brought you peace, love and happiness and that the coming year will bring you much more. I am going back to school to earn a new degree in the Science of Nutrition and then I will earn a Master's in Public Health. Due to some of my own issues as well as everything that little Marshall is going through, I started developing an interest in this field. After researching, I also found out that this is a wide open field of employment in Central Texas. This is not taking into account that we really need a second income -- I would like to be able to take trips with my girls, my son-in-law and my grandsons some day. This won't interfere too much with the beading, so don't worry. There will still be plenty of musings to come and there may be some other surprises at the beginning of the year. Like I've been saying, I'm undergoing a metamorphosis of the greatest magnitude. Told ya so! My New Year will be quite different this time around. But I will keep you updated with all the craziness that surrounds me. I know, I know -- you're on the edge of your seat, right? I don't mean to tease you so badly. 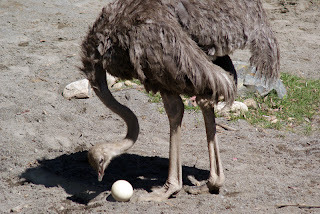 This must be a damned ostrich egg. 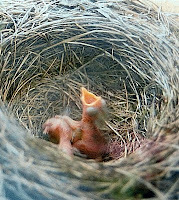 It's taking much longer to hatch than I anticipated! Be patient, beadlings. I'll have news soon. I may be a little excited. I'm very nervous. Are you curious? Be patient. I'll divulge all next week. In the meantime, stay warm. Most folks out there decide to make their New Year's Resolutions on New Year's Eve. I've been very busy for the past week making mine. What I can tell you right now is that there will be HUGE lifestyle changes. I'm not quite sure I'm ready for all of this, but that ball has already started rolling downhill, picking up momentum as it goes. On the other hand, none of changes are being made blindly. I've been researching, gathering information and learning every day. Basically, I've tried to make some informed decisions. There is also a lot of just waiting involved, kind of like sitting on a egg. 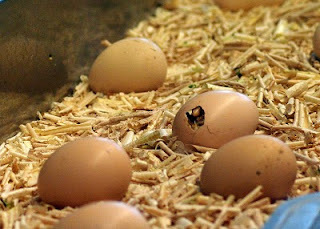 When this egg has hatched, you'll be the first to know!